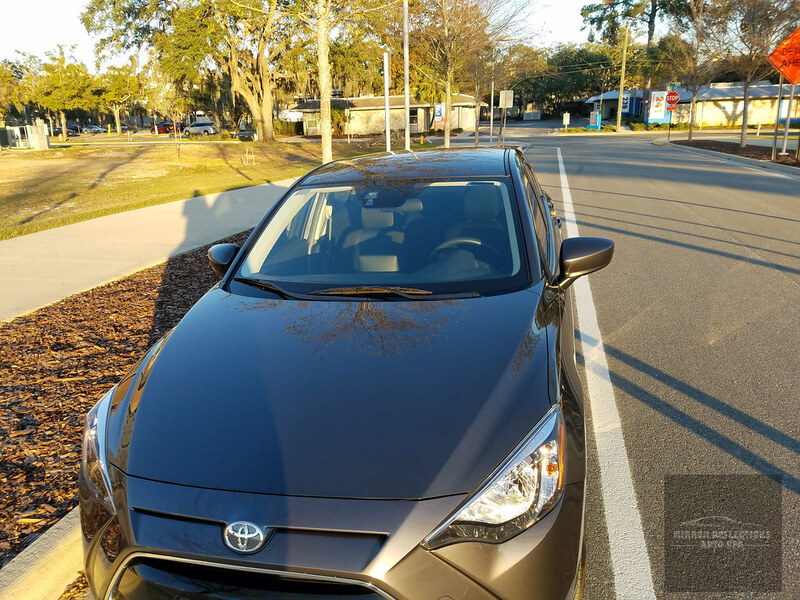 I had been discussing with the owner of this car for a medium to minor level paint correction service with the application of Carpro Gliss for the paint and headlights. 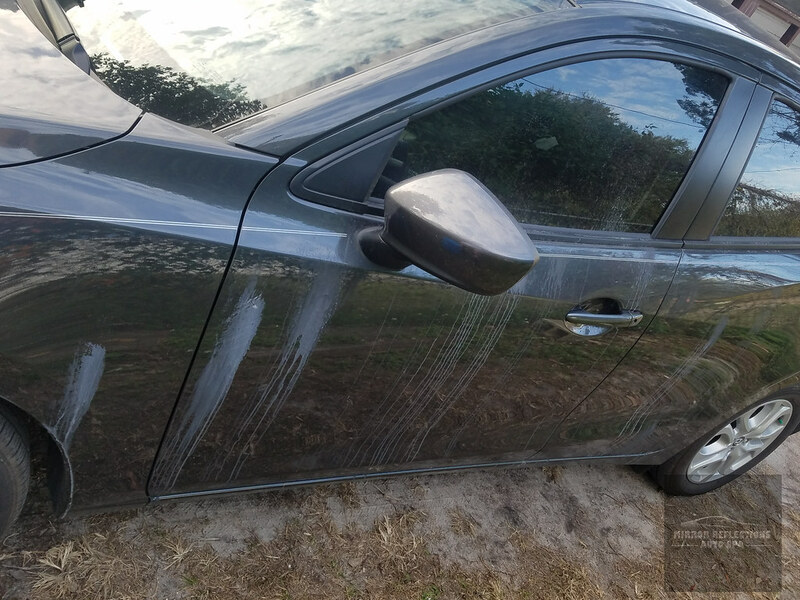 A week after our conversation the owner informed me that a foreign substance had bonded to his car. Upon inspection, I noticed calcium deposits had bonded to the driver side of his car. 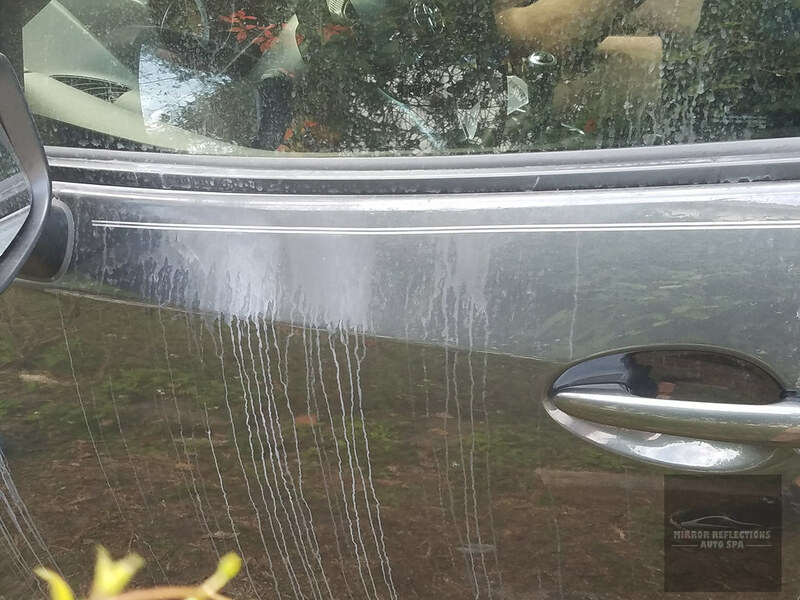 There was also additional paint marring and deep scratches from the owner’s desperate attempts to fix the problem. 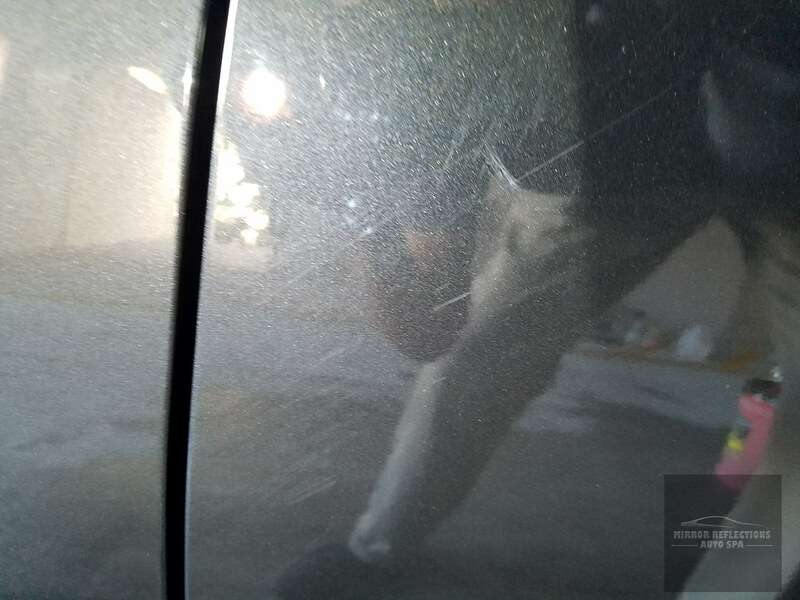 Leaving these deposits on his car for an extended period of time would lead to an auto body shop repair. I was, fortunately, able to find time to take care of his car. To be frank, I do not like using household products on cars. I imagine these products are not produced with car care in mind. But I also am open to appropriately thinking outside the box when the time and situation call for such actions. I soaked a microfiber applicator in vinegar for a few minutes. Then I merely pressed it against the affected areas. I kept my window of 15 minutes maximum time before flushing my working area with water. I found this to be the most appropriate plan of action at the time. It took a couple of applications over each affected area for the calcium deposits to fully release its grip on the surface. 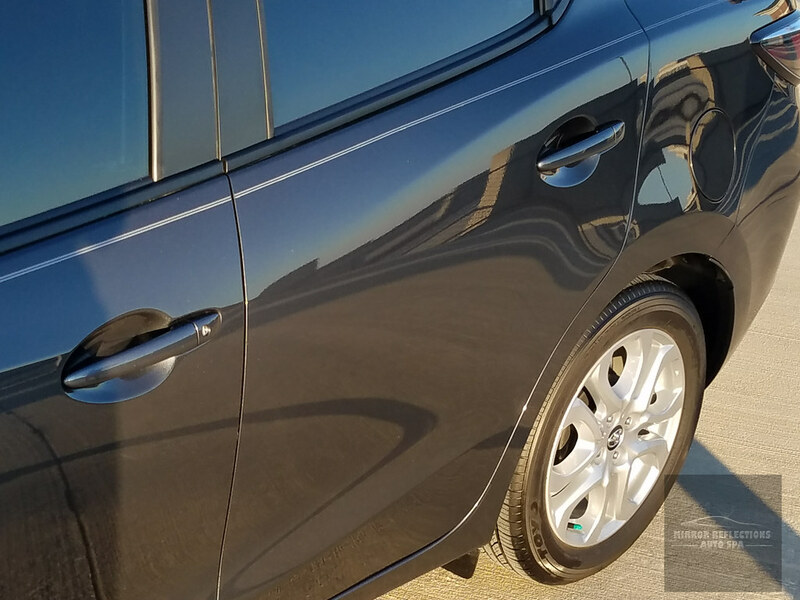 I used Gyeon Water Spot with Wolfgang Uber Rinseless Wash clean up the loosened deposits. After another thorough wash, I would perform my usual decontamination process. Thin Paint! Most readings were between 80 to 110 microns. 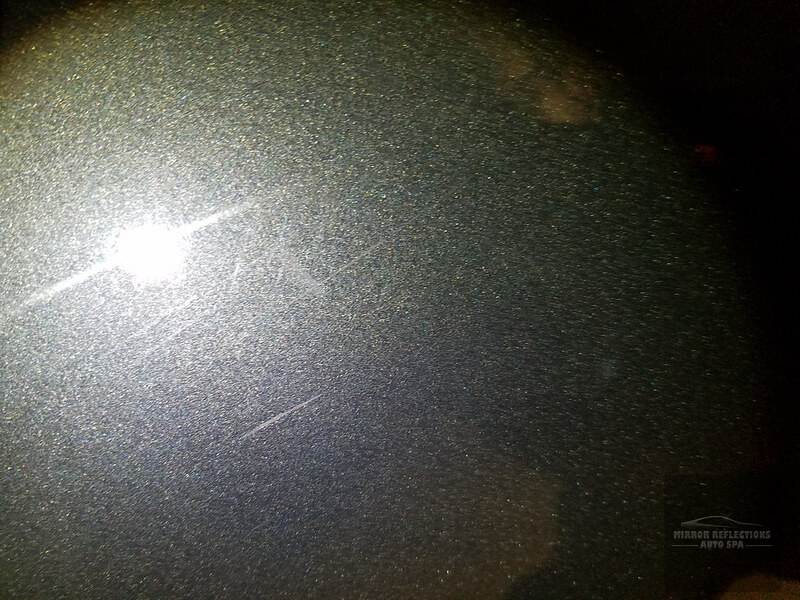 Rupes Medium Quarz Gel Compound became my polish of choice for leveling defects with the Green Rupes pad. I was intentionally taking a gentle approach. A couple of times I would stop to see how much paint was being removed. I used a microfiber glove with FG400 for some of the deep scratches that were in tight areas working in a small proximity. 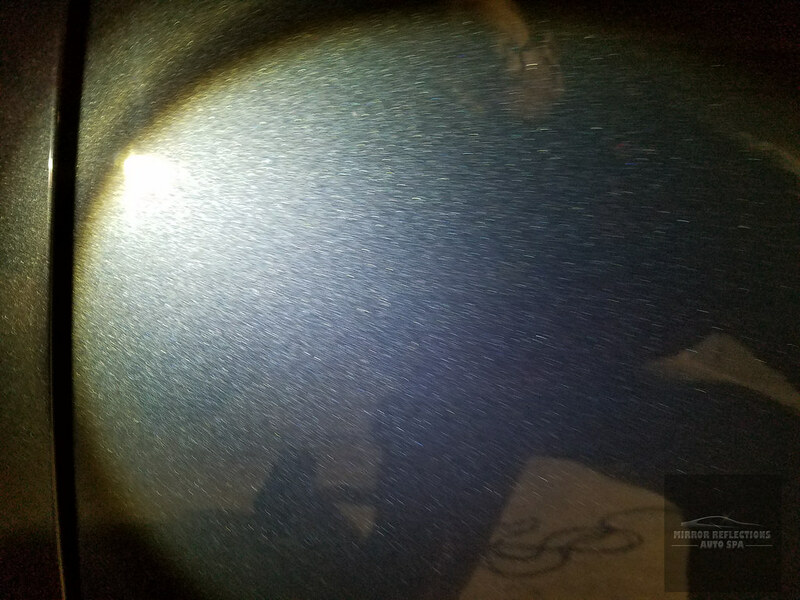 Overall I tried to minimize the use of abrasives over raised body lines, not knowing the prep history leaving the dealership. Obviously, some deep scratches remained. Outstanding work! I loved the background music in the video, too! Thank you! It has been a goal of mine to not torture viewers with the typical music selection. Just a little warning. 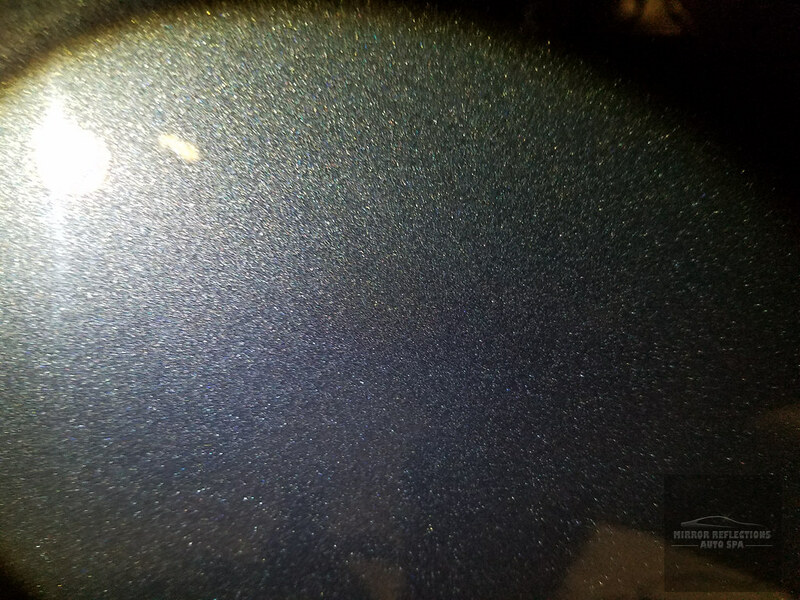 Rupes pads can delaminate when using Menzerma polishes with them. 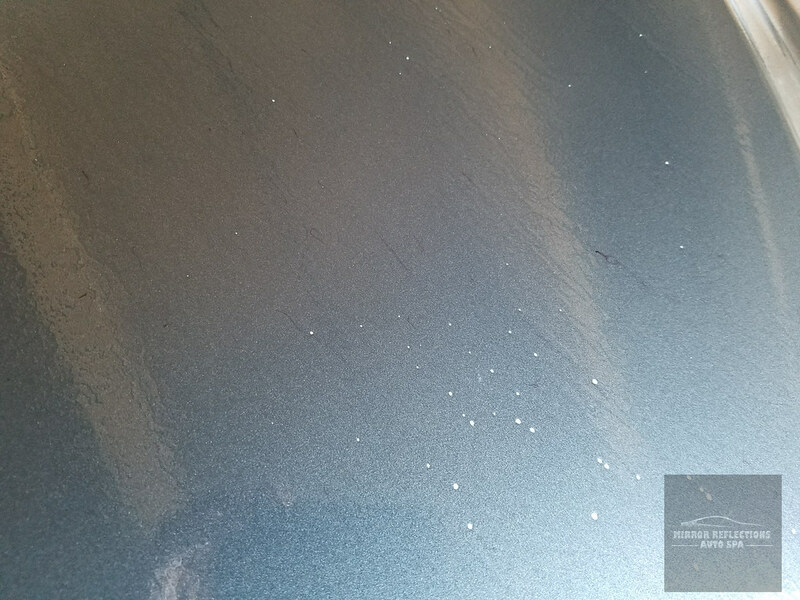 Rupes polishes are water based, where Menz polishes are not and can cause the glue on Rupes pads to giveaway. 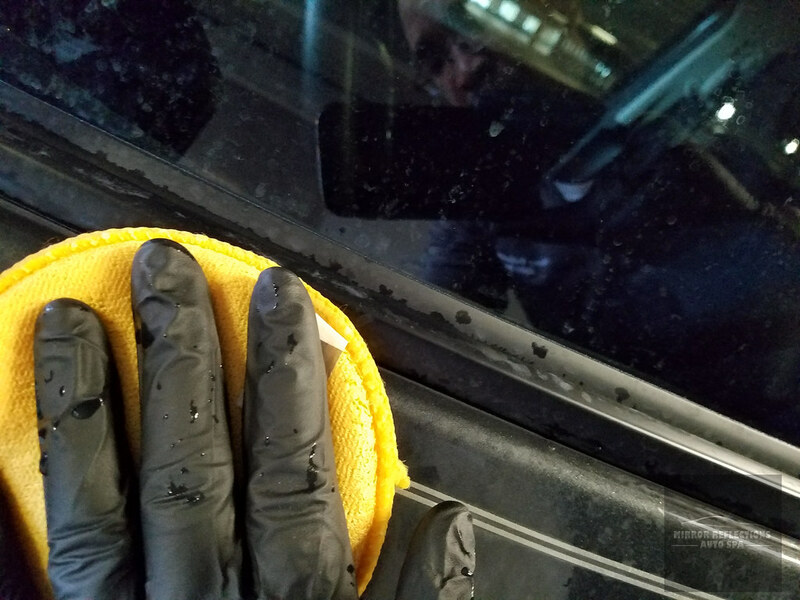 Pads are the most expensive tool a Detailer has so use Menz polish and Rupes pads knowing you may shorten the life of your pads. Rupes is aware of the problem. This is true. It is the main reason why I pair the Medium Gel Compound with the Green Pad because the Green Rupes pads seem most vulnerable to oil based. On very rare occasions when I use that particular pad I will switch very frequently. The Rupes green are the easiest to blow up. Ive ruined way too many Rupes 4 inch green pads, but the other Rupes 4 inch pads hold up well. After I had problems with some Rupes pads they graciously sent me some to replace the ones that failed. I am careful not to overload, overheat, or over use pads, they cost too much. At over $10 a pad you can’t afford to destroy too many on a vehicle. I’ve just about gone totally microfiber or wool for cutting. 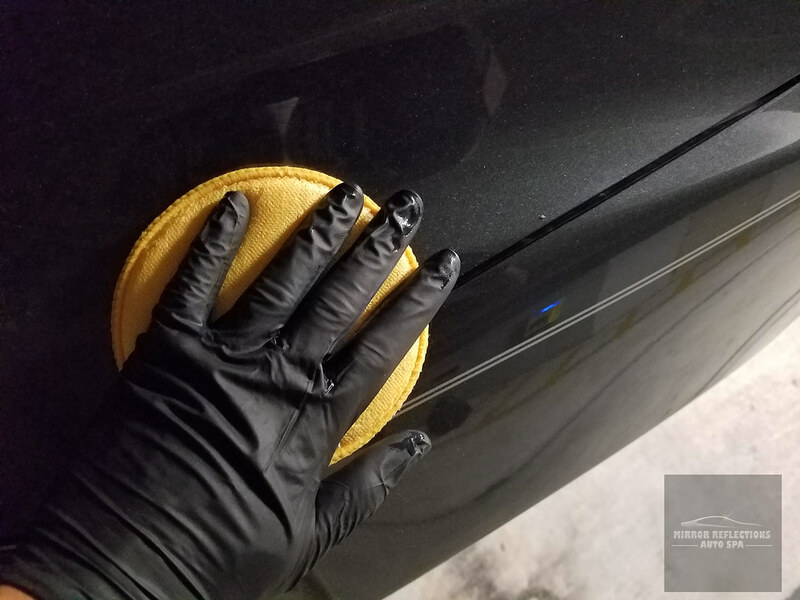 Rupes yellow pads are unfortunately my favorite pad that I use for finishing. If I use Menz products with Rupes yellow pads I change them out much quicker and try to use less product. Nice article and great job. But as to the comment about Menzerna Polishes, please do some research. Menzerna Polishes ARE water based. Technically theyre oil in water emulsion. They do contain a petroleum distillate but it is a lubricant ,not a solvent. They have been making polishes longer than anyone.In well over 45 years of detailing I have found them to in some cases work magic. Sorry for the confusion of Menzerma makeup. Please speak to either of the Rupes USA reps about using Menzerma polishes with Rupes pads. My info came from Rupes after my pads suffered the consequences. I’ve been using Menz products for around 10 years and are some of my favorites due to their wide range of polishes. Many products have TSOs that can effect pads in different ways. If you use Menz products with Rupes pads with no problems, congrats, I was just posting based on my experience and Rupes explanation of what went wrong. I plan on writing about this in more detail when I get some more time. 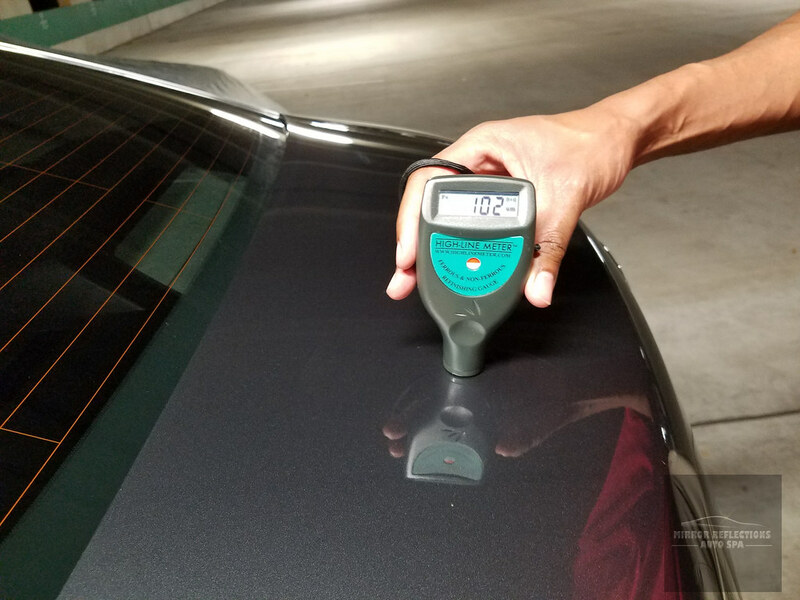 This is a more common issue than some would think in the detailing world. Hey Rodney, great job on the car there. Big fan of how thoroughly you seem to think through everything to make sure you’re getting the best results. Great knowledge of how to alternate products and what not around as well so they work most effectively. Thank you Connor!! I still consider myself very much a student of detailing.